← The new AndyScoggin in NJ is under construction. This a reprint of a feature article from HorseRacingNation.com. On HRN.com you will find video of all ten of the races. There is a link at the bottom to see the full piece. The Sprint provides the most excitement per second in the Breeders’ Cup combining pure speed on the front end with the chance for a dramatic closing finish. All of this in less then a minute and ten seconds. In the 27 years of the Sprint only five favorites have won producing an average win payoff of $20.53. This top 10 list features great frontrunners and amazing victories from the back of the pack. From ten down to one, these races document the exciting history of the Breeders’ Cup Sprint. 10) 1984 – Eillo – Play It in Reverse – No better place to start the countdown then with the very first Breeders’ Cup Sprint. Monmouth Park based Eillo was trained by veteran Budd Lepman for Crown Stable. The name Eillo came from reversing the name of his owner Ollie Cohen. Jockey Craig Perret guided Eillo to a wire to wire victory over Commemorate at Hollywood Park. Eillo’s win price of $4.60 is the shortest payout in Sprint history. Tragically Eillo died four weeks after the Breeders’ Cup due to complications from colic surgery. 9) 1988 – Gulch – Persistance Pays Off – Persistence certainly paid off for the connections of Gulch who won a Breeders’ Cup in his third try after running 5th in the 1986 Juvenile and 9th in the 1987 Classic. Gulch had graded stakes wins at distances from 6F to 1 1/8 for owner Peter Brant and trainer D. Wayne Lukas. Gulch was 6th after a half mile and was guided between horses by Angel Cordero, Jr. Fast early fractions of :21 and :44-1 setup the closing run on the sloppy Churchill Downs track. 8) 2002 – Orientate – Streaking to the Crown – Orientate entered the Sprint at Belmont Park having won 5 stakes races in a row including the Vanderbilt and Forego Handicaps. The D. Wayne Lukas trainee went off as the betting favorite. Jockey Jerry Bailey had Orientate sitting just behind and to the outside of the speedy early fractions of :21-2 and :43-4. He just got up in the final strides to defeat long shot Thunderello. 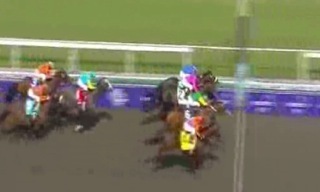 The win was Bailey’s 13th in the Breeders Cup and second consecutive victory in the Sprint. Orientate clinched the sprint championship for owners Bob and Beverly Lewis. 7) 1987 – Very Subtle – Nothing Subtle About This Win – Very Subtle crushed this field by 5 beating the previous year’s contenders Groovy and Pine Tree Lane. Ridden by Jockey Pat Valenzuela Very Subtle got to the lead shortly after the start. Valenzuela said, “She won really easily. She ran a really great race.” The Mel Stute trainee handed Groovy, the heavy favorite at .80-1, his first loss in seven starts in 1987. Owner Ben Rochelle bought Very Subtle for $1.2 million in a dispersal auction. 6) 1990 – Safely Kept – Shadow Dancing – Safely Kept was the 1989 Eclipse Award winning Sprinter even though he lost the Breeders Cup Sprint to Dancing Spree. In 1990, Safely Kept had 7 wins in 9 starts yet went off at 12-1. Trained by Alan Goldberg for Jayeff B Stable she battled head to head from the turn with the favorite, Sheikh Maktom’s British Horse of the Year and three year-old champion, Dayjur. Approaching the wire Dayjur took the lead by a neck, but jumped a shadow on the Belmont stretch, allowing Safely Kept to go by and win by a neck at the wire. Yet this year she finished second in the Eclipse Award to Housebuster who did not contest the Sprint. 5) 1997 – Elmhurst – “Storming Down the Outside” – There is nothing more exciting than watching a horse rally from dead last to victory in a six furlong sprint. Elmhurst, who was bred in Kentucky by Calumet Farm is a personal favorite of mine. His victory triggered one of my best Breeders’ Cup betting scores. His 16-1 odds produced a $395 exacta, $3,203 trifecta, and $20,127 superfecta. Elmhurst was last after 3/8th of a mile and then commenced a ground saving run up the rail. The first quarter of 21-2 and half in 43-4 set the race up for a come from behind victory. At the top of the Hollywood Park stretch Cory Nakatani swung him to the outside. He was so far behind that Tom Durkin did not pick up the closing move until he was already in fourth place and then, “Here comes Elmhurst storming down the outside … Elmhurst gets there in the final strides.” Elmhurst’s victory gave the trainer/jockey combination of Janine Sahadi and Nakatani consecutive BC Sprint titles. 4) 2000 – Kona Gold – Three, Two, One – Betting favorite Kona Gold finally found the Breeders’ Cup winner’s circle after he finished third in the Sprint in 1998, and second in 1999. This running of the Sprint highlighted blazing speed. After a “wild first quarter of :20-4” and the front runner going “full throttle”, Kona Gold took the lead in mid-stretch and held on for the victory. The 1:07.60 time set a Breeders’ Cup and a Churchill Downs record for six furlongs. Jockey Alex Soils and trainer Bruce Headley recorded their first Breeders’ Cup wins. 3) 2009 – Dancing in Silks – Closest Finish of All – Dancing in Silks was supplemented for $180,000 into the $2,000,000 Sprint. He got a perfect trip under Jockey Joel Rosario while sitting in fourth place just outside of the early speed. Long shots Cost of Freedom and Crown of Thorns, a fast closing Gayego, and Dancing in Silks hit the wire within a head of each other. The official margins between the four horses were a nose, a head, and a nose. The victory gave trainer Carla Gaines and Rosario their first Breeders’ Cup wins. The California-bred paid $52.60, the second highest in Sprint history, for his victory over the synthetic surface of Santa Anita. To see my number one BC Sprint race click here HorseRacingNation.com. This entry was posted in Breeders Cup, Horse Racing Nation. Bookmark the permalink.